The giving machines are operating in five different locations: Salt Lake City, Utah; New York City, New York; Gilbert, AZ; London, England; and Manila, Philippines. The international charities that benefit are care.org, unicef.org, WaterAid, and Water for People. Giving machines in each location also partner with local charities. Here in Utah, those charities are the Utah Food Bank, Utah Refugee Connection, and Eye Care 4 Kids. 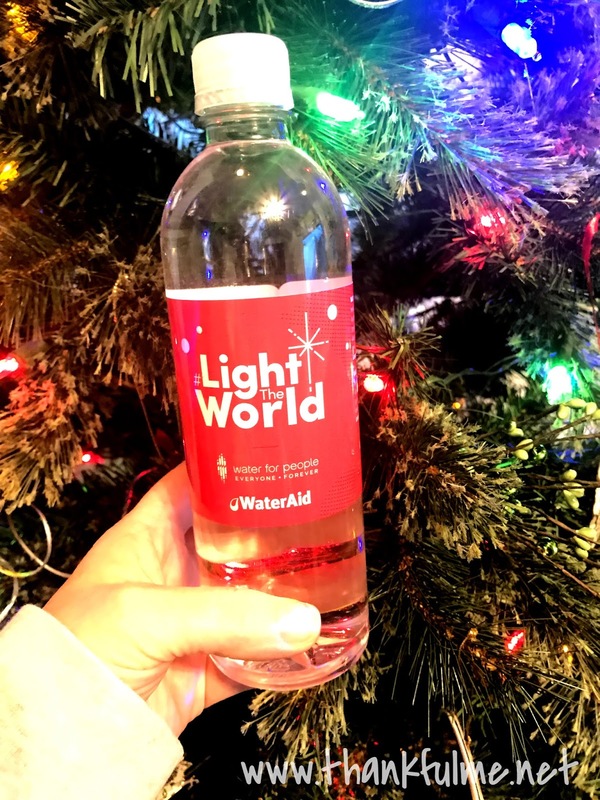 The unveiling of the machines last night was in preparation for the #LightTheWorld campaign, which officially kicks off on December 1st with a worldwide day of service. Then for each of the next 4 weeks, the initiative will concentrate on different themes: Light the World, Light Your Community, Light Your Family, and Light Your Faith. I'm super excited for this weekly approach to the idea of lighting the world! I'm also delighted that of the people I have approached, all have agreed to share guest posts with us. I'm looking forward to learning about how they light the world. Some of them will probably be familiar to you; others will be new friends. Nancy of Wyoming Breezes will be our first guest, and her post will publish on Monday, December 3rd. You won't want to miss it! 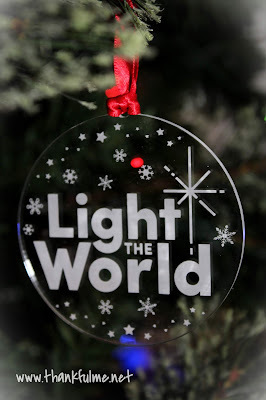 Finally, I'm thankful for LDSBookstore, who has graciously provided me with some beautiful #LightTheWorld Christmas ornaments to offer as a giveaway to you, my readers! The first giveaway starts now, and will end at midnight on Sunday night/Monday morning. Be sure to enter below, and good luck! I don't know which ornament I prefer; they are both beautiful. Do you have a preference? 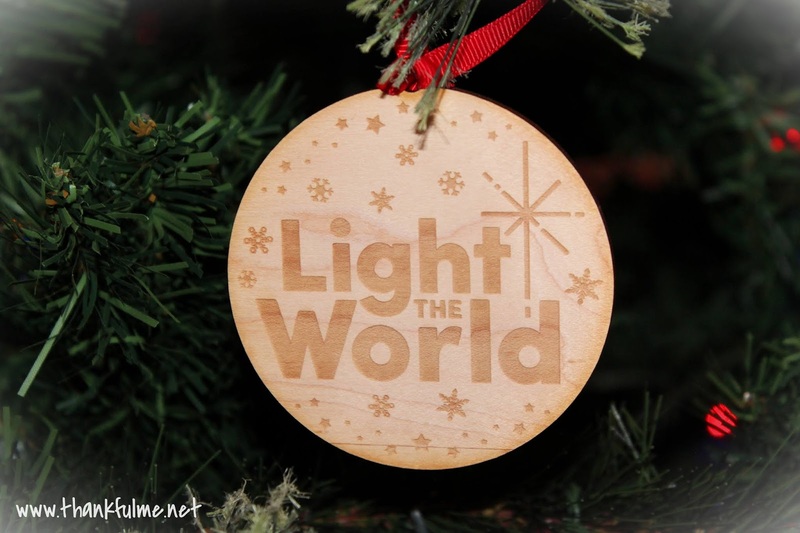 How do you light the world? Update: Though I had planned on offering weekly giveaways, since no one entered the 2nd one, I decided to just have Rafflecopter pull the other winners from this first giveaway. Congratulations to the winners: Dynal, Kasey, and Kelly! I will be participating in my ward Light the World activity on Dec. 1. We are donating items that we will use to make hygience kits for teens at the Liberty House in Salem OR. Either of the ornaments are pretty. The giving machines are clever. I hope the campaign is a huge success. I imagine it will be. Last year, the campaign raised over $550,000 dollars. There are machines in more locations this year, so presumably the impact will be even greater. I am donating towards a Christmas drive at my sons school for a family in need. I'm sure they will appreciate that! The ornament is pretty, and the giving machines are really cool! Everywhere is where we should be seeing these giving machines! I love them both but the wood one is my favorite! I am teaching my daughter the benefits of volunteering, I also like the wooden one. The acrylic circle ornament is my favorite! I am donating many things for a Christmas drive here. We donate toys and food!